Fred Gay, former president and owner of O’Donnell’s Quality Pontiac, Buick, GMC in Cocoa Beach passed away on September 14, 2011. 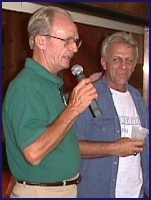 Fred was a long-time CivMil member and community-oriented individual. Over the years , he has been recognized by numerous organizations and charities for his generosity and his amazing fund-raising ability. 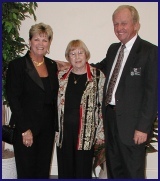 Fred, pictured left with wife Jana and Marge Spezzano, has been honored by Florida Today as Brevard County's “Volunteer of the Year” and is a recipient of the Cocoa Beach Area Chamber of Commerce's Distinguished Service Award. He is the Founder of the annual Mardi Gras celebration in Cocoa Village which has raised hundreds of thousands of dollars for health care. Fred was a great supporter of CivMil and the military. He is the only member who has ever been honored twice as CivMil’s Member of the Year -- selected in 1989 and again in 1994. 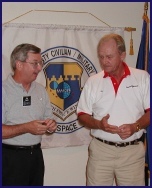 Fred served on theCivMil Foundation Board of Trustees and is a past CivMil Chairman of the Board. 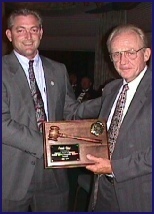 Fred is pictured left presenting one of CivMil’s “world famous” montage plaques to Papa Joe Wickham in 1999. Every member of CivMil receives a space pen in honor of becoming a member. Space pen number one belongs to Fred Gay. 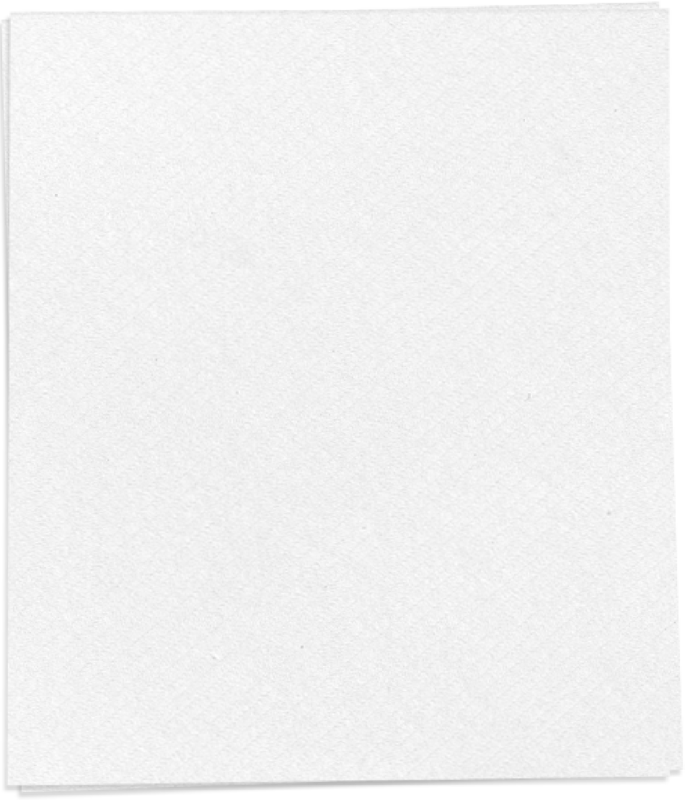 It was Fred's idea to have a silent auction for the first one hundred space pen numbers to raise money for Patrick’s Khobar Towers Memorial. More than $11,000 was contributed for the privilege of owning a CivMil space pen numbered one through one hundred and helped CivMil raise more than $30,000 for the project. It was Fred who determined that CivMil should support Patrick’s Guardian Challenge Team to make sure that they have uniforms second to none during the competitions. Fred also insisted that the 45th Space Wing Guardian Challenge team have a mascot more than equal to bringing home the Schreiver Trophy again and again and again -- thus, the awesome and most feared SNARK (see photo at left) was born. Left is a photo of 45thSpace Wing Commander, Brig. General Don Pettit and then-CivMil Chairman Steve Houser presenting Fred with a memento of Guardian Challenge 2001 in appreciation of Fred’s generous and gracious support of the military. As Chairman of CivMil, Fred presented the first-ever CivMil scholarship - the money for it was donated by Fred himself! When the Civilian Military Community Foundation was formed in January 2000, Fred insisted that the Foundation not only support our military and their families, but also be there for the civilian community in critical-need situations. Our local Red Cross was a beneficiary of that foresight after nine-eleven devastated us all. CivMil trustees, board members, staff and all members extend their sympathies to Fred Gay’s family, especially his wife Jana. Fred, you are missed and remain in CivMil hearts forever.